This is one of the great war novels of our time, and one of my favorite books. It deals with the psychological aspects of Vietnam, from the widespread use of psychoactive drugs to the horrors of PTSD. On the surface, it is a sort of CIA intrigue thriller. Beneath the surface, With its dark and gritty realism with occasional insanity, it is reminiscent of Full Metal Jacket. Many ungodly, unforgettable scenes. Recommended. 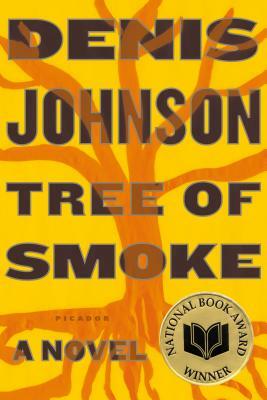 Tree of Smoke is the 2007 National Book Award Winner for Fiction. Named a Best Book of the Year by Time, The Washington Post, The Boston Globe, Chicago Tribune, San Francisco Chronicle, Salon, Slate, The National Book Critics Circle, The Christian Science Monitor. . . .
Tree of Smoke is the story of William "Skip" Sands, CIA--engaged in Psychological Operations against the Vietcong--and the disasters that befall him. It is also the story of the Houston brothers, Bill and James, young men who drift out of the Arizona desert and into a war where the line between disinformation and delusion has blurred away. In the words of Michiko Kakutani in The New York Times, Tree of Smoke is "bound to become one of the classic works of literature produced by that tragic and uncannily familiar war."